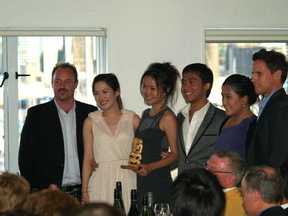 On February 5th 2012, our team of four BBA 17 students consisting of Tatporn (Suey), Vatanya (Euy), Jinjutha (Jinny), and Vacharish (Job) waited anxiously at the Royal Yachts Squadron for the announcements of the awards for the University of Auckland�s Champion�s Trophy Case Competition. After what felt like particular lengthy addresses by the judges, organizing committee, and the dean of the business school, the results were announced: BBA Thammasat was pronounced the 1st runner up of the Champions Trophy. As the four of us walked onto the stage to be presented with our trophy, we knew in our hearts that the journey to that moment of glory was not an easy one. The Champions Trophy is one of the most unique competitions in the world as it only invites universities that achieved top placing in other competitions throughout the year to find the �Champion of Champions�. Teams were divided into 4 divisions in the preliminary rounds, given two computers, no Internet access, and a mere five hours to crack a case. Before being able to advance to the finals, teams had to analyze three different cases and present solutions to a panel of prominent business judges. After each presentation, teams would be ranked in their division. The team that had the best rankings out of the three days would be able to advance to compete in the final round where another case would be have to be cracked. On the first presentation day, our team was presented with a case of an NGO, specifically an accreditation program, called "SPCA Blue Tick", which is supported by Society for Prevention of Cruelty to Animals. When results were announced, we found that out of three teams in our division, we were ranked the third by the judges. That evening was one of the most difficult evenings we had in New Zealand, as we realized the only way our team would advance the final round would be for us to be placed first for the next two rounds of case cracking. At that point, making the finals seemed almost a hopeless task, but at rock bottom, our team knew we had no way to go, but up. That night, we stayed up until the early hours of morning, discussing what to improve on, and where changes would be made. On the second day, we walked to the University of Auckland, determined to make the best out of our day and to bring all we had to the table. We were presented with a case of an SME, named "NextSpace", which is in the business of 3D visualization software for infrastructure projects. 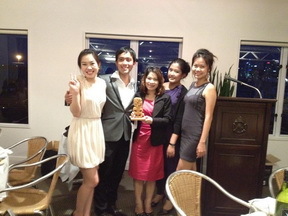 That evening, hope was once again alive, as we had placed first in our division. We knew at this point, that the key to our success, would not only be business analytical skills, the ability to develop creative recommendations, but also the internal strength to persevere through tough times. For the final round, the case was on "Invivo Wines," New Zealand's premium wine manufacturer and exporter. Although we had little prior knowledge on the industry, let alone wine making, we pushed through the difficult case. After presenting to a large audience and prominent judges, including the company's two founders, we walked out of the presentation room feeling the rewards of our years worth of hard work in training and the rest they say, is history. We would like to take this opportunity to express our warmest gratitude to those who have played a significant part in our success. First of all, thank you Ajarn James for all your coaching, support and guidance. Also, thanks to the BBA program for giving us the opportunity. Thanks to all the Ajarns, whose teachings gave us the business foundation. And last but not least, a big thank you to all our friends and family. We truly could not have done it without you. Posted date: February 24, 2012 � 10:45 hrs.